More House Republicans in the new, 114th Congress identify as Catholic than in any other recent Congress, and they now outnumber Catholic Democrats in the House, according to a new Pew Research Center analysis. Although the difference is slight – there are now 69 Catholic Republicans and 68 Catholic Democrats in the House of Representatives – the new balance is a departure from the previous three Congresses (2009-2014). Indeed, just six years ago, there were more than two and a half times as many Catholic Democrats (98) as Catholic Republicans (37) in the House. What’s behind the shift? 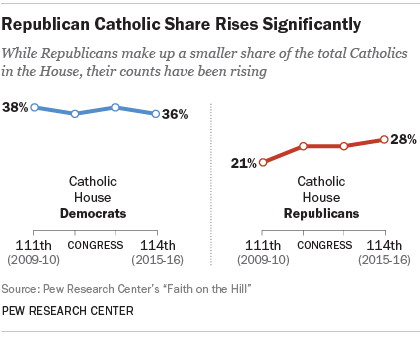 While the increased total number of GOP Catholics in the House can be partially explained by the Republicans’ steady gain of seats during the last three elections, the share of GOP members who identify as Catholic also has grown from the 111th Congress (21%) to the 114th (28%). Meanwhile, the percentage of Catholics among House Democrats has dropped slightly, from 38% to 36%, over that same time period. 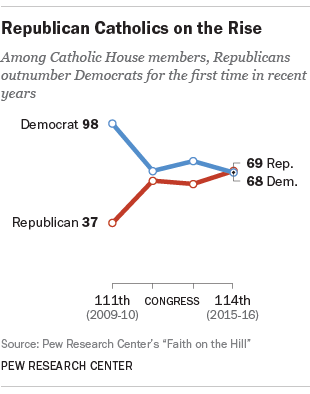 This shift in party affiliation among Catholics in Congress is mirrored in part by the citizens they represent. Among registered voters, white Catholics have trended in a more Republican direction in recent years. In 2014, white Catholics identified with or leaned toward the Republican Party (53%) more than the Democratic Party (39%). However, Hispanic Catholics remain more than twice as likely to identify with or lean toward the Democratic Party as the Republican Party. Among current House members of both parties, about three-in-ten are Catholic (32%) – a share that has remained fairly steady over the last four Congresses. Catholics remain the second-largest religious group in the House, after Protestants (58%). The Senate, which elects members to six-year terms, has seen little change in the total number or the party affiliation of Catholics in recent Congresses. About a fifth of Senate Republicans were Catholic in 2009 and similar share are Catholic today. Note: Due to the resignation of Michael G. Grimm (R-N.Y.), this analysis includes one fewer Catholic Republican in the House compared with our initial report on the religious affiliation of the 114th Congress.